We left Camaret very early on 28th intending to catch the tide at the Raz de Seine and potter around to Benodet as the previous evening's forecast for a Biscay crossing didn't look good. Derrick had a last look at the forecast as we shot, on the tide through the Raz, and realised that things had changed. If we could put up with a few hours of motoring, we would then have good winds for the next 3 days. Change of plan. Off we went. We had a very fast time once the wind had settled in. We sailed "Goosewinged" the whole time with a poled out Genoa and Hydra (our new windpilot) steering for us. The first day was lovely sunshine smooth seas. We saw many different types of seabird including gannets, shearwaters, terns. petrels and even two bonxies. After this lovely start the weather turned rather rainy and the seas became rolly as the wind strengthened. There was nothing much that we could do due to the motion and nothing much to see. Any boredom that might have set in however, was pushed aside by the sheer amounts of dolphins that came to play. 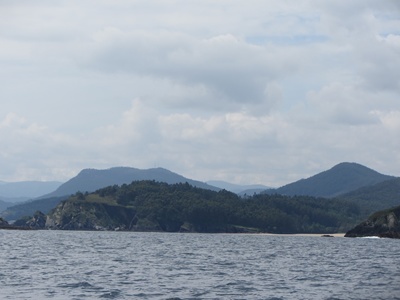 We arrived at the Spanish coast earlier than anticipated due to the speed of the passage. The smell of Eucalyptus, from several miles out to see brought back memories of the last time we were here. Although it was still dark we found our way into the Ria and anchored off the sandy beach at Viviero as dawn was breaking. Average speed for the passage was 7 knots. D was most chuffed! It rained for most of the day but cleared by the evening. We went for a stroll and were very pleased to see that Viveiro was much nicer than either of us remembered. Cleaner and more prosperous. The run down supermarket that seemed only to sell skinned rabbits and chicken feet on our last visit 8 years ago, was modern and well stocked. We enjoyed a couple of days here acclimatising, before moving on.